Daniel Mosch first thought about his death on the morning he died. He wasn't a very religious man and he wasn't a particularly morbid fellow either. It was just that he simply could not avoid it. As soon as he got out of bed he noticed an angel and a devil floating above him. Both were smiling. As any rational person would, he initially considered it a practical joke. He laughed and called to his roommates. Unfortunately for Daniel neither the angel nor the devil cut it out. Instead they made it very clear it was not a joke. “Let me handle this Melph,” the angel intervened. Within seconds Daniel not only felt calmer than ever before but he now understood everything in his life that had brought him to this point. Every mumbled word he almost heard became clear. Every bit of knowledge he almost learned became true. It was the single most pleasant and uplifting experience he’d had in his short life. And when it ended, it was the single worst. He considered his past. “And since you are not a Catholic, a Jew, a Muslim, or any other religion that has an automatic solution for such a case, we are here to help determine were you should end up,” the angel finished. “I am dreaming, right?” Daniel flopped back onto the bed. “We appreciate it when clichés from poorly written stories are not employed by the future deceased. It slows the process considerably.” Another angel appeared at the foot of his bed. He was wearing black. “The Angel of Death,” Daniel almost shouted as he stood back up. “What about that girl I dated, back in high school? She was a drug addict but I stood by her.” Daniel tried again after thinking for a while. And before he could say anything else, several things happened. The devil let out a horrible curse as the angel laughed happily; and the fish disappeared as Daniel dropped dead. 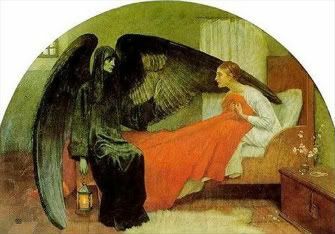 As the Angel of Death melted away the angel smiled at the skulking devil. “I told you that fish would get you into trouble someday. It’s not a very convincing miracle when you do it,” the angel said. “Saved by showing mercy to a fish. That is ridiculous, you have to admit,” the devil responded in anger as they both left the empty bedroom of Daniel Mosch. Previously appeared in Residential Aliens and the Residential Aliens “Best Of” anthology. Alex Moisi is a Romanian born college student, living in Illinois and ignoring real life issues like angry friends and failing classes in favor of post-apocalyptic scenarios and disturbing "What if?"'s. His work can be found in Residential Aliens, Bewildering Stories, the Desolate Places anthology published by Hardley Rille books and Strange Worlds of Lunacy published by Cyberwizard Publications as well as on his website. Keep writing and submitting, finish everything you start no matter how long it takes and submit it, write everyday and submit your stories again and again. Writing is ultimately a marathon, just hang in there and for the love of God don't be afraid of submissions. Congrats Alex! I enjoyed the piece when it appeared at ResAliens.